2012. What Can We Expect? 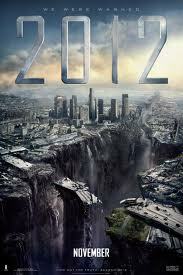 In that sense the dramatic scenes from 2012:The Movie aren’t too far fetched. How comforting though to know that when that day comes it is the “day of the Lord”. And because is the day of the Lord, it has no threat for the people of the Lord. For as in the last scenes of the movie we have already entered into the safety of the ‘ark’ who is the Lord Himself. That is those who have placed their faith in His substitutionary atonement of the Cross where our sins were placed on Him and for those who believe His pure righteousness is credited into our account. That credit is good enough to take us safe through the burning up and dissolving of the heavens and the earth. Jesus is Himself our ark, and we are safe in Him as we negotiate the treacherous waters of the years ahead. One thing though remains. On the day of the Lord the ‘works that are done’ will be ‘exposed’. We are cautioned about that also in 1 Corinthians 3:11-15 and told to take care how we build on the foundation of Jesus Christ in our lives. Works of wood, hay and straw will be burned, only those made with gold, silver and precious stone will pass through the fire with us. Regardless of our work, we are safe but with us will we be able to take some work also. Will the work of our life pass the fire-proof test of God? Our works of love, patience, compassion, mercy and selflessness will. Works motivated by selfishness, hatred, envy, jealously and their like will all be burned up. So as we face the future we can face it both with certainty and uncertainty. Certainy about our eternal destiny, we will be with Christ for ever. Uncertain though is our works – but we can make them certain too. By grace we have received all that is necessary for life and godliness. By the power of the Spirit we can walk by faith and work to ensure that our works also pass through and make it safely into the Ark of God. What will you do? Will you take the love, peace and joy of Jesus you’ve received and change the life of one person? For if all of us serve one who in turn serve another, soon the future will be better indeed. I pray you do! As I pray I will.